England are well on their way to a total whitewash of the Indian team if one goes by the manner in which they chased down a formidable total India put up in the rain curtailed match at Southampton. Australia took early charge of the second Test after bowling out Sri Lanka for a hugely disappointing 174 soon after tea on the opening day in Pallekele on Thursday. 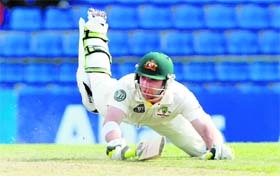 Australia's Phillip Hughes dives during the first day of second Test against Sri Lanka in Kandy on Thursday. Still not assured of a place in the summit clash, an unbeaten India will not settle for anything less than a victory when they take on arch-rivals Pakistan in the final group match of the inaugural Asian Champions Trophy hockey tournament on Friday. 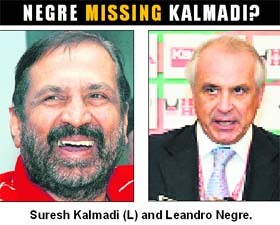 International Hockey Federation (FIH) president Leandro Negre must really be missing the incarcerated Suresh Kalmadi in this time of crises for Indian hockey. When Kalmadi was around, particularly during the turbulent days leading to the formation of Hockey India and the run up to the hosting of the World Cup in Delhi in March 2010, he played his cards well and pulled the right strings to get things moving and cracking at a fast pace. Rafael Nadal lashed out at US Open organisers on Wednesday, claiming players' safety was being put at risk in a desperate effort to make up for lost time at the rain-ravaged Grand Slam tournament. Rally driver, Gaurav Gill has become the first Indian to be ranked No. 1 in Asia, according to the latest World Rally Rankings, released on Sep 7. Gill, with 896 points, is ahead of Fan Fan (China, 740 points). Gill moved into the top spot on the basis of a strong performance in the 2011 Asia-Pacific Rally Championship. English grounds may look pretty with the lush green outfields and some fancy new corporate stands but to have to sit in a makeshift commentary box that rattles and shakes in the strong wind and where to get a wi-fi connection is as tough as an Indian win on this tour, does not speak highly of the organisers regard for the TV media especially the overseas ones who have paid a mini fortune to get the rights for their region. The sad part is that the Indian media unlike its English counterpart, is not vocal about it if the same situation was there in India. While we have to hope that when India visit England in three years time these issues will have been taken care of what can India do to reverse the losing trend this summer? Their batting has come on well though by losing wickets in quick succession they are losing the momentum and thus ending up fifteen or twenty runs short of what could be a winning score. This is a totally unusual space for Mahendra Singh Dhoni who has never seen the face of defeat as closely as he has this English summer. He is still calm and cool but doesn’t seem in control. The game is just running away from him and he is unable to retrieve it but to do so he has to himself step up to take strike. It is then that he can take control as he did so memorably in the World Cup finals. He will be hoping that the coin falls the way he calls it because India’s bowling looks incapable of defending even a score of 500. The batting though can chase down a big total and it is here that Dhoni has to show the way. Suresh Raina is in splendid big hitting form and he needs to get as many overs as he can so that he can not just finish an innings but also speed it up. To do that he has to bat higher up the order and so also the skipper. They run so well between the wickets that even if there are no big shots played there are hardly any dot balls when they are together because of the singles they steal. Parthiv Patel and Ajinkya Rahane have forged a good partnership at the top and they are taking the team to a great start. Both are good players of the short ball and are doing the sensible thing by not going for the sixers but looking to just chip the ball over the in-fielders. India will need to overhaul their attack and bring in Varun Aaron. He is an unknown quantity as far as the English are concerned and may make an impact like Rahane who too was unseen and unheard of before the series began. Bringing him on when the field restrictions have been lifted will give him some protection too and help his confidence. Australia took early charge of the second Test after bowling out Sri Lanka for a hugely disappointing 174 soon after tea on the opening day in Pallekele on Thursday. Fast bowler Ryan Harris led the way with three wickets and Trent Copeland, Mitchell Johnson and Nathan Lyon picked up two each in good batting conditions at the Pallekele International Stadium. Australia, hoping to clinch the three-match series after winning the first Test in Galle by 125 runs, raced to 60 for no loss before bad light ended play 5.2 overs early. Shane Watson returned unbeaten on 36 with six boundaries and Phillip Hughes was on a watchful 23 at stumps. On paper, the high-voltage Indo-Pak encounter might be just a group match but in reality it is a showdown between two traditional rivals out to annex a spot in Sunday's final. Although a draw against Pakistan also could see them through to the final, the young Indian team would like to avoid such a scenario as then their fate will rest on the outcome of other matches. 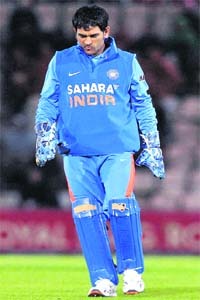 Thus, Friday's match against Pakistan becomes a virtual semifinal for India. India can afford a draw provided Malaysia beat Japan. The Indians could then sneak into the final on a better goal average, that too if Korea beat China, the lowest ranked team in the tournament. 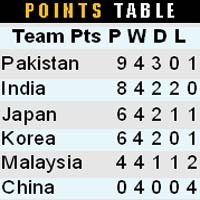 On the other hand, if India beat Pakistan, goal averages would also count for Pakistan and Korea. Considering all the permutations and combinations, the safest bet for India thus would be to beat Pakistan. The match would also give India an opportunity to avenge their 1-3 loss to Pakistan in this year's Azlan Shah Cup in Ipoh, Malaysia. While the International Hockey Federation has been making a lot of noise about propriety and making all the threatening noises, a display of dollars that the FIH needs desperately could well make it change its tune about the Champions Trophy. The thumping success of the World Cup held at the renovated, world-class Dhyan Chand Stadium impressed the FIH top brass. They also realised the enormous potential of generating much-needed funds by selling hockey in India. Kalmadi and his team got many sponsors for the World Cup and filled the FIH coffers as never before. In fact, whenever Negre made one of his many visits to Delhi to inspect the progress of the preparations for the World Cup, he was given a royal treatment and left a happy man. After the World Cup, the FIH saw a lot of merit in awarding the Champions Trophy and the Olympic Qualifying tournament to Delhi, as India was perceived as a cash cow. The FIH also promised to award many other important events to India for the revival of the game here. But with Kalmadi’s arrest in connection with the Commonwealth Games scams, things took a tumble overnight, as it were, as Hockey India was left without a charismatic head -- it is still without a president after Vidya Stokes resigned to fall in line with the Government fiat on tenure and age-limit - forcing secretary-general Narinder Batra to hold the fort. Managing day-to-day administration and getting a challenging event like the Champions Trophy going by roping in the right kind of sponsors, are two different ball games and the present management was not rising to the FIH’s expectations. Though Kalmadi held no formal post in HI, it was common knowledge that he wielded ‘the’ power and played the lead role in the successful conduct of the World Cup. Moreover, HI’s monopoly over the game took a beating when the Government was forced to recognise the existence of the Indian Hockey Federation (IHF) following a Delhi High Court ruling. When Ajay Maken was appointed Sports Minister, he took active interest in getting the two hockey bodies either merged, or form a working relationship, which raised the hackles of the FIH. FIH suddenly became aggressive, as it contended that it would only deal with HI, as the Champions Trophy and the Olympic Qualifiers were awarded to HI. FIH threatened to pull out these events if the “joint board” arrangement mentioned in the “settlement minutes” of IHF and HI was not rescinded, as the FIH Executive Board felt that the settlement “breaches not only the FIH Statutes, but also the Olympic Charter”. Maken was willing to talk to Negre and hoped to settle the matter when the FIH chief visited Delhi on September 13. But Negre pre-empted that decision and in a two-page letter to Maken, in reply to the Government’s response to the initial IHF posers, he stunned everyone connected with Indian hockey by announcing that the Champions Trophy would be moved out of India. But Negre conveniently left out the name of the alternate venue, leaving space for bargaining -- to extract his pound of monetary flesh. The FIH threat was intended to blackmail the Government and HI to give in to its demands, which was evident in the small print of the last paragraph of the letter, which read: “The other point upon which I am being pressed by my Executive Board is in relation to the amount of approximately US$500,000, which is owed to FIH, pursuant to contract for the men’s World Cup held in Delhi in March, 2010.The release of this money is apparently being refused by the Reserve Bank of India. It would help if a written explanation is provided as to the reasons why this money is being withheld together with the steps that the FIH is required to take in order that payment can be made. The money is clearly the property of the FIH”. So that’s it. It all boils down to money and money alone. If Maken manages to make the RBI release the blocked dollars, Negre will once again sing the Indian tune, like a canary! Perhaps the FIH also fears that the World Series Hockey league, to be held under the aegis of the IHF, without sanction from the FIH, will take the thunder away from the Champions Trophy and might eat into the sponsorship business of hockey. Defending champion Nadal, world number four Andy Murray and 2003 winner Andy Roddick joined forces to complain to tournament referee Brian Earley after they were sent out to play on courts that had been battered by almost constant rain. 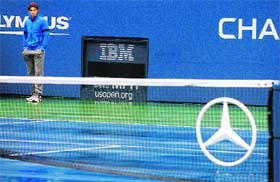 The start of play had already been delayed by 90 minutes but their fourth round matches lasted just 15 minutes before they were hauled off as more rain soaked Flushing Meadows. "We don't want to go on court if it is raining. If I have to go on court, I go on court, but I think it's not fair," said 10-time Grand Slam title winner Nadal, whose match had originally been slated for Tuesday before the whole day's schedule was washed out. The clearly unhappy Spaniard was 3-0 down to Luxembourg's Gilles Muller on Arthur Ashe Stadium when they pair were taken off as conditions deteriorated. "We are not protected. There is a lot of money at the Grand Slams but we are part of the show. They are just working for that and not for us," added Nadal. "It was still raining when they called us on court. The rain never really stopped, the courts were not dry. I know the fans are there but the health of the players is important." Murray, who was trailing 2-1 to America's Donald Young on Grandstand, insisted it was too dangerous to play. "The lines get really slippy. 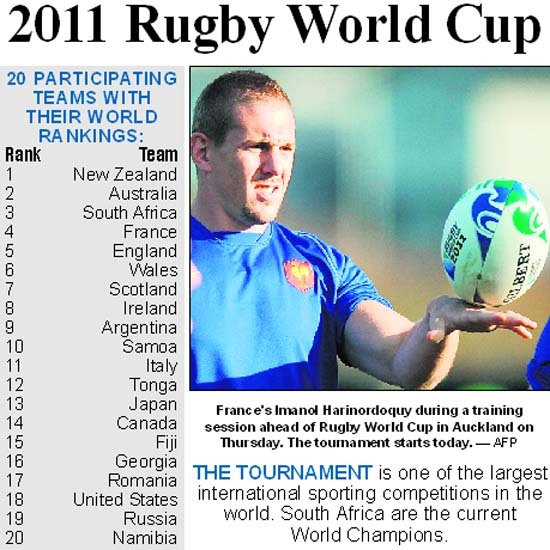 Players want to play more than anyone, but not when it's dangerous," said the Scot. He is currently placed third in the championship standings with 63 points after four rounds with two podium finishes in the opening round in Malaysia and Australia. Gill also leads the FMSCI National Rally Championship with 111 points. Gill started his motors sports career as a motocross rider, before an injury forced him to turn to four-wheeler rallying.